PDF files can test your patience while opening and editing them. PDFVue is a cool online tool that allows you to view and edit PDF files without any bells and whistles. It does not require any registeration, login or softwareÂ download / install. Just open PDFVue website in your web browser and get started working with your PDF files. Use first icon to load PDF files stored on your computer. Second icon allows you to load PDF files located anywhere on the internet. 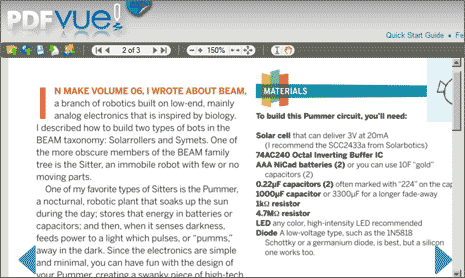 It has very neat PDF viewer that allows you to view pages contained in a PDF file. There are number of tool available on the right sidebar to edit PDF file contents. You can save edited version and share PDF files with anyone – all this done within your web browser without any need to download anything at PDFVue.